A legendary actor Sivakumar's Chithiraicholai painting Exhibition will start from 14th Jan 2016 to 16th Jan 2016 at Kovai G.D.Auditorium. 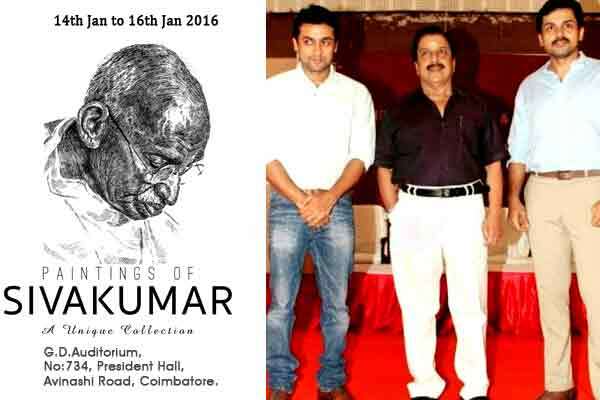 Sivakumar's sons Suriya and Karthi going to inaugurate this exhibition. On account of the most versatile actor, Sivakumar's 75th birthday, actors Suriya and Karthi organized an exhibition, portraying collective paintings of their artist dad, at Chennai. Highly overwhelmed by their effort, Sivakumar appreciated indeed. The exhibition was graced by many celebrities from various fraternities. Considering many requests from fans, "Sivakumar's Chithiraicholai" is to be displayed at Coimbatore on 14,15, and 16th of this month. There is an exciting news for the people is, the event is being attended by Sivakumar himself, every evening of all the three days from 5 pm till 8 pm.The venue and timing details are given below. Write & Share about " Actor Sivakumar's Chithiraicholai Exhibition in Covai | Tamil Movie News | Cinema Profile" !